To draw a tiger is easy once you have a 2D still life picture of a tiger. Here, I'll show a step by step of a tiger picture drawing lesson for any beginners to have realistic tiger drawings using pencil. Before we continue, let's learn something about tigers. Tigers (Panthera tigris) are mammals of the Felidae family and one of four "big cats" in the Panthera genus. They are apex predators and the largest feline species in the world, comparable in size to the biggest fossil felids. The Bengal Tiger is the most common subspecies of tiger, constituting approximately 80% of the entire tiger population, and is found in India, Bangladesh, Bhutan, Myanmar, and Nepal. An endangered species, the majority of the world's tigers now live in captivity. Here I choose to draw still life tigers from two different tiger pictures. I display the pictures of tigers that I chose so you are aware that I personally drew these tigers pencil drawings. Take a HB or B grade graphite pencil. Use it to draw sketches. Start by sketching the head part only. Here's the magic part... Look at your still life tiger picture subject and start from the center. Draw a part of the eye first without looking at the paper! Then, stop looking at your subject and compare it with your sketch. 2. Does it has a correct angle based on your position? If the answer is NOT to any of these questions...Erase it, and re-sketch your drawing according to the correct size and angle. Repeat the same process until you complete a whole one part of your pencil still life sketch. 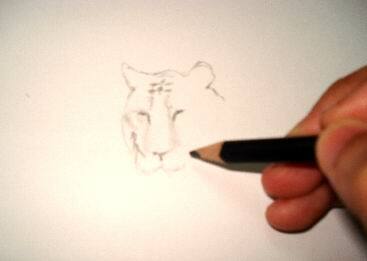 For example, you can consider a pair of eyes is a whole one part of a face in your tiger pencil drawing. Now put down your HB or B grade graphite pencil and take out your 2B and 4B grade pencils. 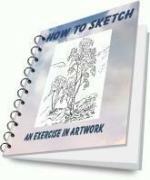 Start to create tones in your tiger pencil sketch drawings. 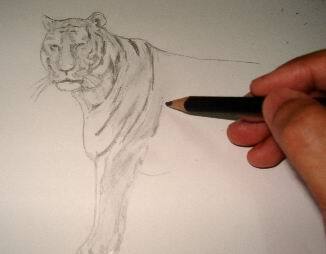 Make your tiger pencil drawing alive! Take note that you are drawing in a black and white pencil sketch. There will be no other color... yet you are drawing a 3D subject! So, you have to differentiate the tones to represent a 3D perspective. You can start with any of the two pencils. I suggest you use a 2B pencil first to create fine stroke from the center to the outer part of your tiger pencil drawing. Follow the contour curves of the surface to produce a depth effect. Then, use a 4B pencil for darker tones especially the 'deeper' part (in a 3D perspective) of your subject. Sketch the other part of your tiger still life drawing subject. Repeat Step No. 1 to Step No. 5. Your hand drawn tiger pencil drawing. Get it? 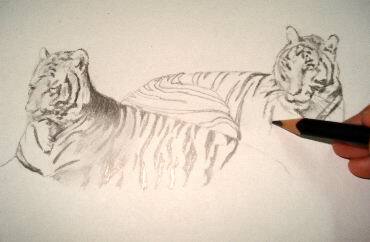 Or have any questions or comments on how to draw realistic tiger drawings in pencil? Click here to ask or comment on tiger drawings.